Playing a preview build of Tanzia reminded me of days long gone, spent whiling away the hours in vanilla World of Warcraft. Indeed – and I say this as a compliment – Tanzia is like a single-player take on the humble beginnings of Blizzard’s powerhouse MMO. It’s an action RPG with a similar art style and mechanics, wherein you play a spellcaster who combines the best aspects of World of Wacraft’s Mage, Druid, and Shaman classes. In true fantasy RPG fashion, you play as a youngster who’s destined to be a great hero. 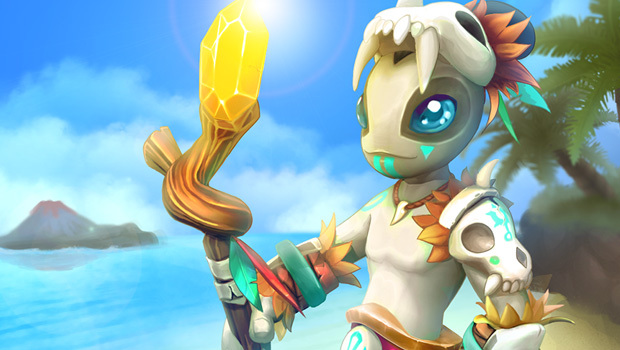 You’re the grandchild of Mako, a shaman who once saved the land of Tanzia from an evil threat. Now, the Skeleton King is back for more, and with Mako having disappeared, it’s up to you to save the day. It’s far from the most original premise, but even within the confines of the preview build, it managed to take some surprising turns and get me invested in this world. It also works well as a means to frame the action-adventure RPG gameplay that’s Tanzia’s real draw. When I say that Tanzia is like World of Warcraft, I’m not just name-dropping. Its control scheme, user interface, and hotbar-driven combat system are more than a little bit reminiscent of WoW, and even the spells available to your character will be familiar. You start off with an ice spell and a fire spell that synergise just like a Mage’s Frostbolt and Fireball, allowing for some efficient kiting. As your arsenal expands, you get more varied tools: crowd control spells like Roots and Fear (which function exactly like their World of Warcraft equivalents), area-of-effect nukes that are vital for taking on large hordes of enemies, and even the ability to shapeshift into a bear and plant totems with various effects. You’re a hybrid Mage-Druid-Shaman-Warlock, is what I’m saying. World design, too, has more than just a passing resemblance to World of Warcraft, with that same sort of colourful, cartoony aesthetic. Architecture that looks heavily inspired by that of Blizzard’s trolls and orcs, and the tropical islands of Tanzia call to mind Stranglethorn Valley and the Echo Isles. Indeed, more than anything else, Tanzia dredged up nostalgic memories of my first steps as a Troll Mage, hunting raptors off the coast of Durotar long before Echo Isles ever became its own zone. That’s a big part of why I love what I’ve played of Tanzia. Yes, it’s derivative, but so is everything – hell, little about World of Warcraft itself is original. Moreover, Tanzia derivative in a way that’s really quite charming; it beautifully captures that rough-around-the-edges sense of wonderment that World of Warcraft had in its early days, before it lost its heart to a few expansions’ worth of polish and Things To Do. In saying that, I would like to see a little bit more originality in the final game, at least around the sorts of spells that you have access to. The hybrid spellcaster is a great foundation and one that Tanzia uses well in its current state, but I’d love to see more fresh ideas built on top of that base. In the other direction, World of Warcraft has a lot of good ideas around user-friendliness that Tanzia would do well to incorporate, like extra hotbars for the multitude of spells and potions available. A better mana management system is a must; combat relies heavily on magic, but your mana pool is small anddoesn’t naturally recover. I’m not saying Tanzia should necessarily incorporate something like World of Warcraft‘s food and water conjuring, but the potion-popping and frequent trips back to mana-restoring save points can grow tiresome. Tanzia is a game that proudly carries its World of Warcraft inspiration on its sleeve, and I hope that doesn’t lead people to write it off as a hapless clone. It’s more of a homage, taking early WoW’s feeling of curious awe and bottling it in a concise single-player experience, and that is a delightful thing to experience. Tanzia is developed by Arcanity Inc. It’s due out later this year for PC. The developers gave Shindig beta access to the game for the purposes of this preview.